I am sure you recollect the memories of Marina beach of Chennai (If you are from Tamil Nadu, India) as soon as you read the title of this recipe. Young boys sell them at beach when you relax yourself there. Sometimes, I feel my visit to beach never completes without buying this Sundal from young boys, Mango slices garnished with red chilli and salt and Hot chilli bajjies. If you wonder what it is of, go ahead and read to know the meaning of each word of the recipe name. 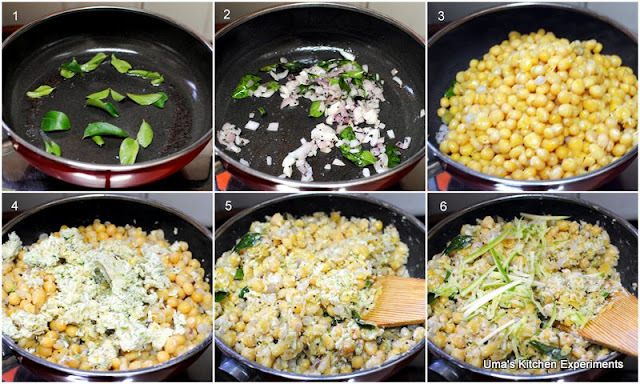 This sundal is often prepared by using dried white peas soaking them in water whole night and boiling them. You can even substitute this with dry green peas sundal or chickpeas or any others pulses. 1) Wash the white peas well and soak it for 8 hours or over night. 2) After 8 hours, pressure cook it by adding required salt and water. 3) When the steam from pressure cooker releases, drain the excess water. Remove any loose skins of the white peas if any. Mash few peas. Keep it aside. 4) Coarse grind the ingredients given under coarse grind. First grind green chillies and then add grated coconut. After adding coconut, grind only for half second to one second. Keep it aside. 5) Heat oil in a pan/ kadai. Once it is hot, add mustard seeds and allow them to splutter. 6) Add asafoetida and immediately add curry leaves followed by onion. Saute till the onion become soft and not becoming brown. 7) Now, add the peas to the pan. Mix well and cook for few seconds.Taste and adjust the salt. 8) Add coarse ground paste now and mix again. Now you will get the exact texture of beach sundal. Turn the flame off. 9) Garnish with grated mango and serve warm. 1) You can also add finely chopped mango and coconut to this sundal. 2) The coconut green chilli paste gives the exact texture of sundal sold in beach. If you don't prefer it, you can slit the green chillies and add along with onion and use grated coconut finally before turning the stove off. Lovely sundal, as said sundal goes back to memories in beach. Memories .. memories :) .. sundal looks inviting. Makes me nostalgic, my fav sundal.. I was just thinking about making this sundal the last few days. so nice to see someone already posting on it. a chennai's signature dish..any chennaite wld adore this..meee..